24 Rue Blomet, 75015 Paris, France. Staying at Aberôtel Montparnasse (3-star hotel) is finding rest and tranquility in the heart of Paris. Located close to the historical centre (the Eiffel Tower, the Latin Quarter, the Invalides) and from the business districts (Montparnasse and Porte de Versailles). 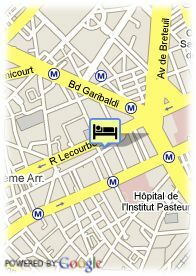 Aberôtel Montparnasse gives you the comfort of a charming residence right in the center of Paris. Use the invitations of its indoor garden and of its 28 rooms which reflect the taste of distant skylines and the change of scenery of trips in Orient. The hotel is enterely air-conditionned and equipped with an internet free WiFi access. The hotel makes available for his customers various services such as: fax, service of photocopies, newspapers, magazines, tourist information and map of Paris, reservation of restaurants, shows and excursions. A parking for cars can be reserved in a garage on 150 metres of the hotel. Parking fee required (15.00 €). Near exhibion centre, Near trainstation, Centre, Near subway / tramstation. Breakfast is served in the cafeteria, as well in your room at no extra charge. All-you-can-eat buffet: hot drinks, orange juice, pastries, fresh fruits and fruit salad, muesli, cornflakes, pat, chees, yoghurt, jam and honey, Nutella. Close to Aberôtel Montparnasse: the Eiffel Tower, the Invalides, the Latin Quarter, the Unesco, the Hôpital Necker, The Pasteur Institute, the Porte de Versailles, Montparnasse.